The secret is out on Taipei City. The startup hotbed has some of the most tech-savvy citizens worldwide with 88% of locals connected to the internet and 75% owning a smartphone. Taipei's techie talent base is supported by Taiwan’s Ministry of Science & Technology which has invested a tremendous amount of resources and capital to boost the local startup ecosystem. Taiwan also has a history of economic prowess: the country has produced the largest electronics contract manufacturing company and two of the largest pure-play chipmakers. Now, Taipei City is strategically developing a globally competitive startup ecosystem with a focus on AI, Biotechnology, and Advanced Manufacturing & Robotics. Live Taipei Startup Survey link! Local founders can take the survey now to be included in the 2019 report. Here, we provide some highlights of how well those sub-sectors are developing in Taipei City. For a deeper dive, be sure to check out Startup Genome’s 2018 Global Startup Ecosystem Report. The AI, Big Data and Analytics market is Taipei City’s leading startup sub-sector in terms of VC investment allocation between 2012 and 2017. A driving force is AppWorks, an accelerator and VC fund with 323 alumni generating a combined annual revenue of $1 billion. AI applications for Advanced Manufacturing are particularly promising for Taipei City, yet the ecosystem is producing success stories in different fields like commerce-focused, Appier, which has raised more than $80 million. In September, the GEC+ event in Taipei City focused on "enabling social impact" through AI, and Startup Genome CEO JF Gauthier spoke at the event. Taipei City’s Biotech sector is expected to reach $120 billion in production by 2025. Roughly 18% of local VC investment between 2012 and 2017 went into Biotech, solidifying it as the second strongest sub-sector. Success stories in this space include the Taiwan Liposome Company, TaiMed Biologics, and JHL Biotech. As a leading hardware hub with strong R&D capabilities and IP protection, the demand for efficient computing and integrated circuits is on the rise in Taipei City as much as the demand for machine intelligence (so-called AIoT). Startups like industrial AI company Thingnario are built around this demand, exploiting machine intelligence and deep learning to predict operational key insights, such as energy consumption and maintenance requirements. 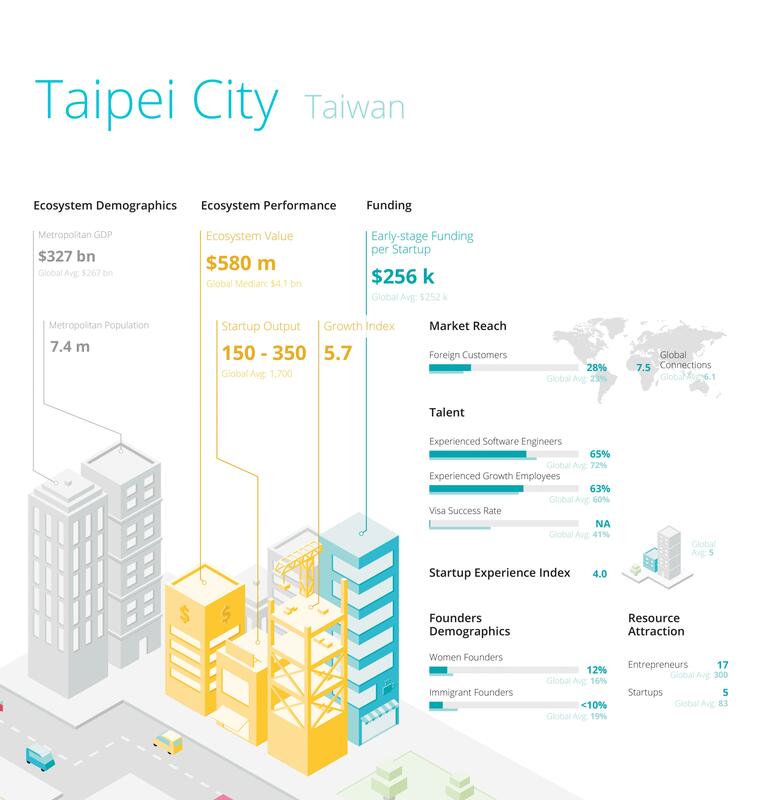 In the 2019 Global Startup Ecosystem Report, Startup Genome will update this analysis and provide new benchmarking for Taipei City and dozens of other startup ecosystems. We’re currently collecting founder surveys from the leaders of tech-enabled business under 10 years old in the area. Taipei founders that participate receive an individualized assessment benchmarking their startup locally and against 45+ ecosystems worldwide, as well as discounts and access to software and services. To take the 10-15 minutes survey by 1/31/19, click here.